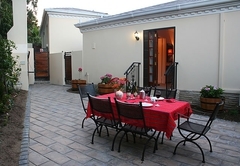 Blaauwheim Guest House is a 5 star graded guest house with self catering option, offering Somerset West accommodation for tourists and visitors of Cape Town. 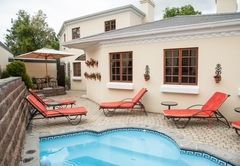 Blaauwheim Guest House in Somerset West is a small 5 star establishment offering personalized service in a safe and secure environment. 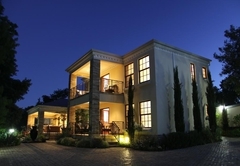 Blaauwheim has two luxury suites called Pinotage and Chardonnay and a superior double bedroom Shiraz. The suites are comprised of a spacious lounge / living room / dining room / kitchenette, double bedroom with en-suite bathroom and guest toilet. The couch in the living room doubles up as a double bed sleeper couch. The kitchenettes have full size fridge / freezers with mini bar, a hob with gas and electricity, multi function microwave and a dishwasher. 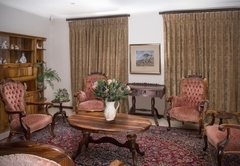 The suites are fully equipped for a maximum of four guests. 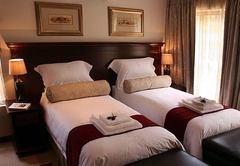 The bedrooms all have extra length king size beds (or twins), and we only use superior 300TC cotton percale linen and luxurious silk filled duvets. 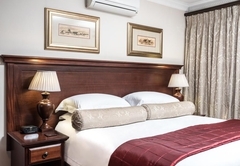 Bedrooms and lounges all have flat screen TVs, DVD players and DStv. Electronic safes, hair dryers, pool towels, robes and slippers come standard. All bathrooms have his / hers basins, separate bath and shower, bidet, toilet, under floor heating, heated towel rails and shavers’ plugs. 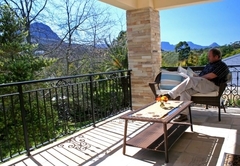 Pinotage has a veranda and Chardonnay a balcony with views of the Hottentots-Holland Mountains. Shiraz has a small private garden with a gazebo and barbecue. 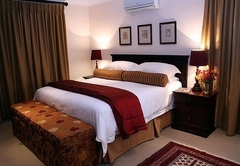 All rooms have private entrances and there is ample secure off road parking. 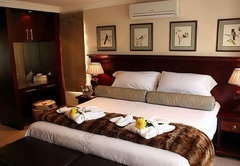 There is free Wi-Fi in all the rooms and tea / coffee and Muscadel are complimentary. The splash pool is solar heated and has soothing spa jets. This very private area is ideal for a barbecue. 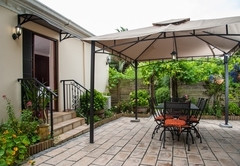 The garden has secluded seating areas ideal for reading or bird watching. It is also frequented by squirrels, chameleons and lizards. The barbecue room / living room has an all weather built in barbecue where Johan prepares the most delicious authentic South African dishes. Breakfast at Blaauwheim is always a feast, a celebration of life. 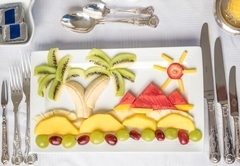 It starts off with Johan’s beautifully crafted individual fruit platters that delight the most fastidious guests. 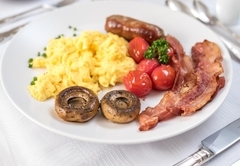 There is a selection of cereals, cheese, bread and rolls, yoghurt and fruit juice followed by a hot plated meal with your choice of eggs, bacon, sausages, fried tomatoes, mushrooms, etc. The Blaauwheim coffee pot and tea pot are bottomless and Johan or Jo-Anne are always ready to refill your cup. We gladly assist with transfers, car hire, golf / restaurant bookings, day trips / excursions / guides and laundry. Fax and print facilities are also available. Because we are South Africans, we know of all the gems off the beaten track. 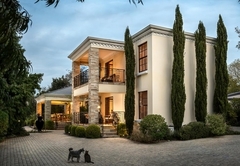 This luxury suite consists of a bedroom with en suite bathroom, a lounge/dining room/kitchenette , a guest toilet and verandah. 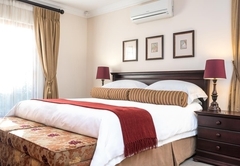 The sleeper couch in the lounge makes a very comfortable double bed, where we can accommodate a third adult or chil;d.
This luxury suite consists of a bedroom with en suite bathroom, a lounge/dining room/kitchenette , a guest toilet and balcony. The sleeper couch in the lounge makes a very comfortable double bed where we can accommodate a third adult or child. Luxury En Suite Bedroom. King size extra length double bed or twin singles. 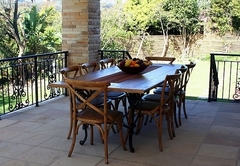 Full en suite bathroom with private garden and barbecue facility. Response timeBlaauwheim Guest House typically responds to requests in 5-10 minutes.